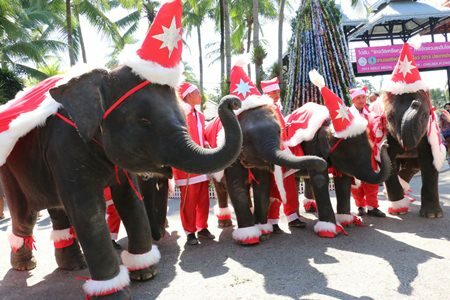 Nong Nooch Tropical Garden celebrated Christmas with dancing angels and elephants dressed like Santa Claus. Park Director Kampol Tansajja opened the festival Dec. 22 with eight elephants dressed in red and white, and women dressed as angels behind them handing out sweets and gifts. In addition, the elephant theatre organized a special show and an elephant parade performed 6 times a day through Dec. 31. 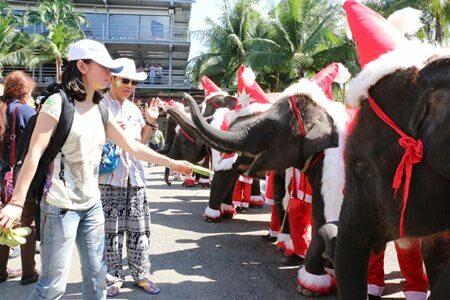 Pretty girls and elephants wish everyone a Merry Christmas at Nong Nooch Tropical Gardens. Nong Nooch Tropical Garden celebrated Christmas with young elephants dressed like Santa Claus.